Maclachlan, Ian R.. "Lethbridge". The Canadian Encyclopedia, 12 May 2016, Historica Canada. https://www.thecanadianencyclopedia.ca/en/article/lethbridge. Accessed 18 April 2019. Lethbridge, Alta, incorporated as a city in 1906, population 83 517 (2011c), 74 637 (2006c). The City of Lethbridge is located 215 kilometres by road southeast of CALGARY overlooking the steep, coulee-dissected valley of the OLDMAN RIVER. 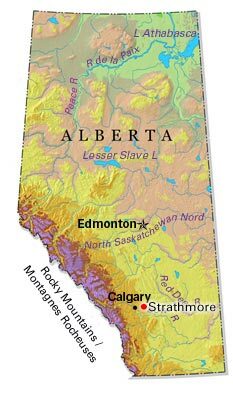 Nomadic Blackfoot claimed the Lethbridge area as their summer hunting territory prior to European contact. Significant European incursions into the area did not begin until 1869 when Montana traders built Fort Whoop-Up, one of the most notorious whisky-trading posts in the Prairie West. Large-scale coal mining became feasible in 1885 when the North Western Coal and Navigation Co, directed by Sir Alexander Galt and his son Elliott, completed a railway to their mine from Dunmore, near Medicine Hat, on the Canadian Pacific Railway (CPR). What began as a mining camp in the valley bottom became a town laid out on the prairie serving the fast-growing colliery workforce. Named Lethbridge in 1884 after North Western Coal's first president, William Lethbridge, the community was incorporated as a town in 1890. High level train bridge at Lethbridge Alberta - the longest of it's kind in the world. 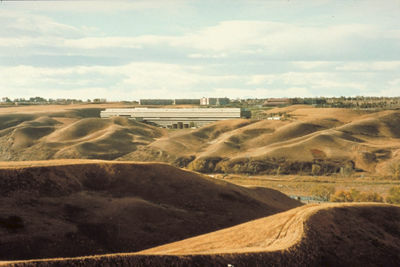 Designed by Arthur Erickson, the university is nestled into the steep bank of the Oldman River (photo by James Marsh). 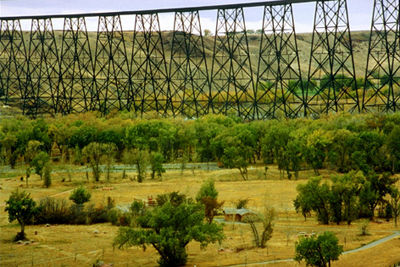 High Level Bridge in Lethbridge, Alberta (photo by James Marsh). A second rail link leading to the Montana border was completed in 1890. The CPR began to operate the Lethbridge-Dunmore line in 1897 and extended it west to serve the coal mines in the Crowsnest Pass. Lethbridge became a CPR divisional point in 1905 and was incorporated as a city in the following year. In 1909 the CPR completed an impressive single-track viaduct across the Oldman River Valley. Just over 1.6 kilometres long and 96 metres above the valley floor, it is Lethbridge's most dramatic landmark. Railway improvements made Lethbridge the principal transportation junction and largest marketing and distribution centre between Calgary and the US border. Irrigation played an important role in the evolution of Lethbridge as agriculture displaced coal as the key local resource and the main source of jobs. Between 1898 and 1900, Mormon migrants from Utah built a 185-kilometre long system of canals to divert the St Mary River, the first large-scale irrigation system in Western Canada. The land area supplied with irrigation water expanded between the World Wars and doubled between 1965 and 1985. Over 70% of the land under irrigation in the Lethbridge area is devoted to forage and grain crops grown principally as livestock feed. However, irrigation also supports the production of canola, sugar beets, pulses and vegetables, and these are processed in the Lethbridge area. The manufacturing sector features several food-processing industries as well as some heavy manufacturing. Irrigation water is also a vital ingredient for the many large-scale intensive livestock operations (ILOs) found less than 20 kilometres from the city's northern boundary. ILOs have a significant local economic impact and create employment in livestock trade and transportation, companies supplying the agricultural sector and a medium-sized hog processor (see also animal agriculture). The city functions as the service centre for surrounding agricultural communities, however, the information economy is also significant. This is manifest in the growth of Lethbridge College (1957), the Lethbridge Research Centre (1906, which houses both federal and provincial agricultural research facilities) and the University of Lethbridge (1967). The university is the city's second-largest employer while the college ranks third. Together these institutions contribute significantly to the population of the city and its consumer spending. Lethbridge has become a retirement destination with adult condominiums and residences offering various levels of care for the elderly. These have become a conspicuous feature of the cityscape and its economic structure. Until 1968 the city was located entirely on the east side of the Oldman River. The street grid was traditionally divided by the CPR into a north side (working-class district located close to the coal mines) and a south side (middle-class merchants and professionals). 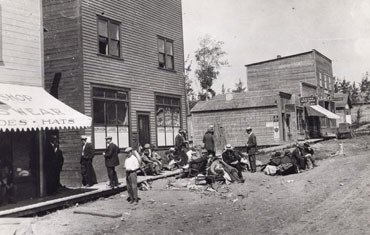 As a mining town, Lethbridge was never wealthy. Tree-shaded streets in residential neighbourhoods dating back to the turn of the 20th century are lined with modest wood-frame houses; brick and stone were rarities as residential construction materials. The city's last coal mine was shut down in 1957; however, its tipple, water tower and machinery buildings are still extant and a conspicuous reminder of the city's mining heritage. In 1971 the university moved to a new campus on the west side of the river, hitherto a sparsely populated rural area. This major new investment prompted a westward shift in the orientation of the city. With the construction of the university, a new road bridge and many new residential neighbourhoods in West Lethbridge, the centrality of the city's downtown was reinforced and the west side of the city became its fastest growing residential area with over one-third of the total population. In 1985 the CPR marshalling yards were relocated outside the city, making a large land parcel in the core of the city available for redevelopment. Thus the downtown saw substantial investment in the 1980s and 1990s, which included a diverse mix of commercial, housing and public-sector redevelopment. The Oldman River Valley bisects the city, and a chain of parks runs from south to north through the valley bottom. Indian Battle Park commemorates the defeat of a Cree war party by Blood and Peigan warriors in 1870. Galt Gardens, an inner-city park covering four blocks, forms the core of the downtown, while Henderson Lake and Nicholas Sheran parks provide artificial water bodies in suburban areas. The Nikka Yuko Japanese Garden is a striking feature on the shores of Henderson Lake, drawing attention to the city's Japanese community. Lethbridge has an unusual mix of cultural and ethnic groups. Mormons occupy a prominent place in the economic and social life of the city. Though they live in colonies outside the city, Hutterites are a distinctive part of the downtown scene, especially on Thursdays when they appear in the core area to shop and socialize. The Blood Reserve, Canada's largest Aboriginal Reserve in terms of land area, lies just west of the city, and a growing number of First Nations people have been attracted to Lethbridge's urban lifestyle and its employment opportunities. A number of Mennonite and Buddhist churches and a Muslim centre add further variety to Lethbridge's cultural life. Recreational sports are accommodated in ice arenas, indoor pools, baseball and softball diamonds, and an indoor soccer complex. Spitz Stadium is home to the Lethbridge Bulls of the Western Major Baseball League; the University of Lethbridge Community Stadium supports football, rugby and soccer; and ENMAX Centre houses the Lethbridge Hurricanes of the Western Hockey League. The Yates Memorial Centre is home to the Lethbridge Symphony Orchestra and several theatre companies. The award-winning Southern Alberta Art Gallery hosts a variety of travelling exhibitions in the downtown area while the University of Lethbridge has one of the largest art collections of any university in Canada. CASA accommodates an exhibition gallery, classrooms and studios for visual and performing arts. In the river valley’s bottom, a replica of Fort Whoop-Up provides visitors with a vivid portrayal of 19th-century commerce in the North-West Territories. Overlooking the river valley, the Sir Alexander Galt Museum and Archives houses permanent and travelling exhibitions depicting the history of the region. Located in a nature reserve, the Helen Schuler Coulee Centre offers opportunities to explore the natural history and ecosystem of the Oldman River Valley. A.A. den Otter, “Coal town in Wheat Country: Lethbridge, Alberta, 1885-1905," Urban History Review 1 (1976), "Lethbridge: Outpost of a Commercial Empire, 1885-1906," Town and City: Aspects of Western Canadian Urban Development (1981) and Civilizing the West: The Galts and the Development of Western Canada (1982); Alex Johnston and A.A. den Otter, Lethbridge: A Centennial History (1985, revised 1991); Ian MacLachlan and Bruce MacKay, "Lethbridge and the Trans-Canada Airway," Alberta History 48 (2000). LethbridgeThe website for the City of Lethbridge, Alberta.